As soon as I saw that Victoria Nail Supply had three of the six Color Club Fractured shades, I ordered them! Yesterday I received the same three shades from Color Club to review, so let's pass on the extras that I bought. I'll be reviewing these later in the week, and one winner will receive the three (new) I bought from VNS. 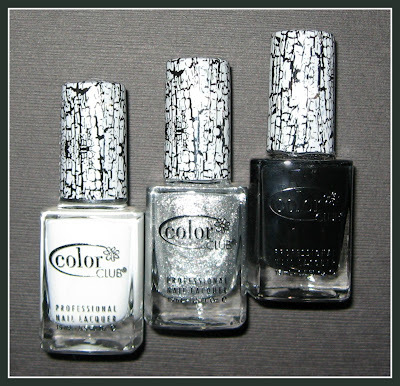 The first three shades that Color Club has released are Clean Break (white), Broken Tokens (silver), and Smash Hit (black). The other three shades which will be released shortly according to Color Club, include a fuchsia, a blue, and a gold. If you'd like to enter to win these three Color Club shades, just leave your eMail in the comments below. Entries will be accepted through midnight on June 18. The winner will be announced Monday (6/20) in my Come Monday weekly newsletter. Followers only, please. soco 210 at yahoo dot com! Would love to win these! Especially that silver one.. I own a grey but the shiny silvers are just too pretty. I would also like to enter. I've really enjoyed reading your blog! :) This is a great prize! Can't wait to see you posts on these. Hi! thanks for thats giveaway! Wow, thanks for this giveaway! Awesome! I haven't tried a white yet! yay! how exciting is this?! Please enter me! cherylcherylcheryl(at)gmail(dot)com. Thank you for this giveaway! Thank you for this great giveaway ! Ohh I want! Thanks for the great giveaway! Herreralissette at yahoo dot com thanks for the giveaway. thanks for this giveaway, i want to enter please ! i follow you via GFC Ingrid AUGUSTIN ! omg would LOVE these! thank you! Thanks for this giveaway...I would love to win them! Thank you for the chance! Good luck everyone!! This crackle fad makes me excited for what the next big thing will be!